DefRev Scoop: Jordan Adopts Hyperstealth Advanced-Tech PSD Urban Digital Camo | DefenseReview.com (DR): An online tactical technology and military defense technology magazine with particular focus on the latest and greatest tactical firearms news (tactical gun news), tactical gear news and tactical shooting news. The following article contains digital pics of a Jordanian Security Forces (JSF) operator demonstrating the JSF’s brand new Hyperstealth-designed "PSD Urban" advanced-tech digital urban camouflage pattern. This is breaking news, and it’s confirmed. The Kingdom of Jordan has just adopted a highly-advanced digital urban camouflage pattern designed and developed by Hyperstealth Biotechnology Corp. specifically for the Jordanian Security Forces (JSF). This means that the Jordanian Security Forces (JSF) now have what is most likely the most advanced urban camouflage pattern in the world. DefenseReview has been reporting about Hyperstealth Biotechnology Corp.’s advanced digital camouflage patterns for awhile, now. The links to previous articles on Hyperstealth digital camo are provided below (at bottom). (December 19, 2004, Vancouver, B.C.) His Majesty King Abdullah II of Jordan recently embarked on an extensive camouflage development program to be issued to Law Enforcement units in April/May 2005. To make the pattern unique to the Kingdom, the map of Jordan is imbedded every few inches within the uniform. The new Uniform cut and style was designed by guidelines from his Majesty with input from the Military and executed by the Military Office. Certain features from the current Jordan Armed Forces uniform were combined with the best features from the U.S. Army BDU, U.S. Marine Corp MARPAT and British DPM uniforms. The Head dress (not in photos) is styled on the German WWII Afrika Corp. M43 cap in the Digital patterns. The digital pattern, designed by HyperStealth has a few improvements over other North American digital designs with both the Macropattern and Micropattern elements allowing for better concealment at farther distances and simulated reflection and shadows elements. A former Lt. Col in the U.S. military who was one of the first to see KA2 called it the best pattern he has ever seen. A former 30 year veteran of the U.S. Army (24 years served in Army Special Forces) commented that not only does it look good, it looks like it will be effective. 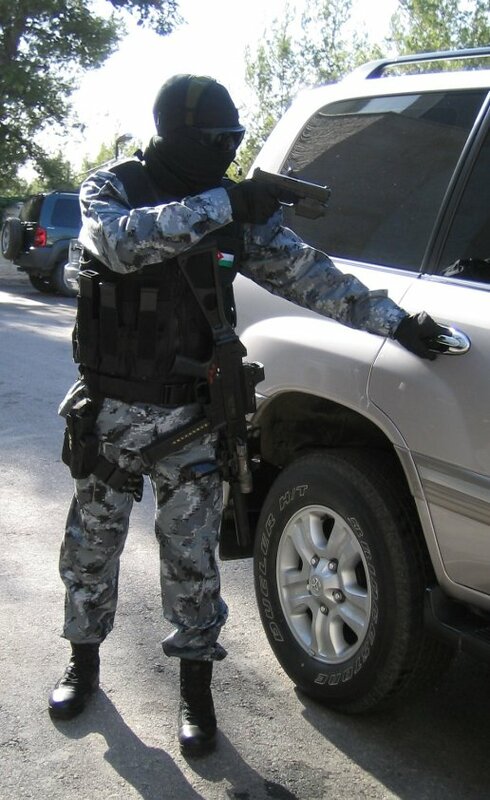 Jordan continues to develop and expand their digital concealment programs with HyperStealth for their Armed Forces." For information related to tactical camouflage development, or to the new JSF (Jordan Security Forces) PSD Urban digital camouflage pattern or uniforms spefically, please contact HyperStealth Biotechnology Corp., directly at [email protected] or phone (604) 961-7046. Ask for Guy Cramer. Click on this link to visit Hyperstealth Biotechnology Corp.’s PSD Urban advanced-tech digital urban camouflage page. Lots of great pics of a Jordanian Security Forces (JSF) operator demo’ing the new camo. "Fracture Camouflage™: You can’t hit what you can’t see." "Fractal Camouflage and New Digitized Tiger Stripe Camo Patterns"
"Tactical Assault Camouflage (TACAM): Multi-Environment Counterterrorism Camo"
"Millenium Texture Series Camouflage (MilTex): Privatized Answer to CADPAT/MARPAT"
"Dual Texture Camouflage (Dual-Tex Camouflage) Digital/Digitized Camouflage"